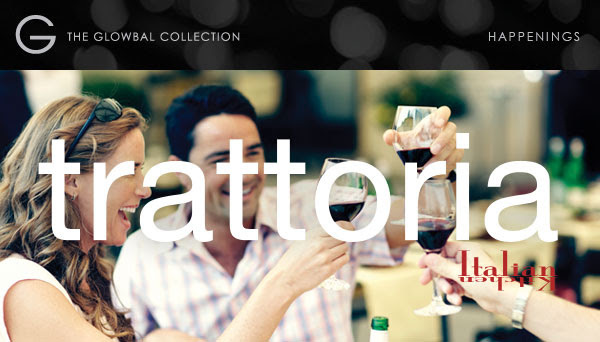 The GLOWBAL COLLECTION is pleased to announce Trattoria Park Royal will open on Saturday, May 10. The new space, which follows the same concept as the original Trattoria (located on West Fourth Avenue), marks GLOWBAL’s ninth Vancouver restaurant. Part of the exciting expansion project at West Vancouver’s popular Park Royal shopping centre, Trattoria is located on the exterior of Park Royal South. Staying true to the Trattoria brand that GLOWBAL has nurtured since opening the first location in 2008, guests to the new space can look forward to traditional Trattoria cuisine, inspired wine selections and friendly service, enjoyed in comfortable surroundings. “My wife Shannon and I live in West Vancouver and we’re happy to have a new Trattoria so close to home. It almost feels like an extension of our own kitchen. We look forward to sharing the new space with our friends and family,” says Emad Yacoub, Proprietor of The GLOWBAL COLLECTION. Trattoria boasts an expansive dining room with floor-to-ceiling windows, a sunny rooftop patio, plus cozy patio-seating out front the entrance of the restaurant. Designed by BOX Interior Design, the 3,650 square-foot space features an open kitchen concept, butcher block-style tables, warm aged-wood paneling, and polished concrete floors. Stand-out design elements include a wine barrel-backed bar and wine bottle chandeliers – large-scale lighting fixtures custom-made using more than 100 wine bottles. Executive Chef Jonathan Chuy, who comes to the new location from the original Trattoria, oversees a menu showcasing casual Italian fare, including burrata and bruschetta, carpaccio and insalata, pizza and pasta, classics such as eggplant parmigiano and veal saltimbocca, and sweet dessert selections such as tiramisu. Weekend brunch will be offered as well.